Do you remember Spectrum’s Magical Mystery Tours? Let us know with a comment! Always a great time for everyone to get to know each other. Kids also learning that teachers are human beings and able to relax at appropriate times. AND teachers learning that there’s no such thing as an everyday kid. We learned more about ourselves on those days than any curriculum could provide. Wonderful memories that I treasure! When Spectrum was created, in the early 1970’s, it’s educational philosophy was humanistic, student-centered, and positive. Many emerging practices were included making Spectrum a much-studied model for reform and innovation. A key idea was the Teacher Advisor system, which was first-line counselling and support, not just homeroom. For that to be effective, teachers had to really get to know their TA students and those students needed to trust their TA as someone to turn to. So, many activities were organized around that nuclear group, one of which was TA Afternoon. Early in September, the school would close for most of a day and TA groups would disperse thro ughout the city to do something together. Some would organize a picnic in a park. Others would go bowling, when that was popular and available. A number of teachers had boats so they would take their students sailing or waterskiing. As the logistics involved in creating so many different activities were a challenge, Spectrum’s first principal, Wally Russell, organized the first Magical Mystery Tour, in 1978. Instead of groups going their separate ways, busses took everyone to a secret destination in an odyssey named for the famous Beatle song and film. TA groups still worked together to organize food and games for events at Island View Beach, the first time out. 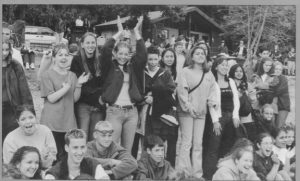 Despite its success, the Magical Mystery Tour did not immediately become a Spectrum tradition and, for the next few years, TA activities were centered at the school. 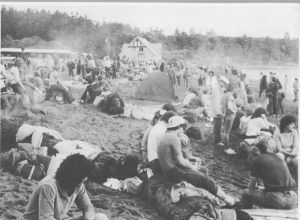 In the mid-1980’s, Principal Maurice Preece called for another tour which took everyone to the Esquimalt Lagoon, where the fierce winds made the TA kite flying contest a near-Olympic event. There was soon another one during his tenure and, from 1988 on, the Magical Mystery Tour was an annual September highlight. 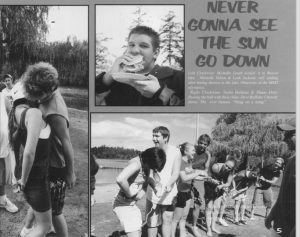 Mystery locations included: Bamberton, Shawnigan Lake Park, Witty’s Lagoon, Gyro Park, and, a regular favourite, Beaver Lake. The tour ended, as such, when the school doubled in size, in 2005, to accommodate grades 9 and 10. Lack of busses or even a venue that could accommodate such a crowd meant things had to change and the event became a Welcome-Back Barbeque, at the school. But traditions die hard and the MMT was transformed to become a very special grad activity for grade 12’s in the spring of their final year at Spectrum.